A village in Judea, thirty furlongs from Beth-horon, and a three days' march from Gazera. Eusebius ("Onomasticon," s.v.) describes it as being near Guphna. 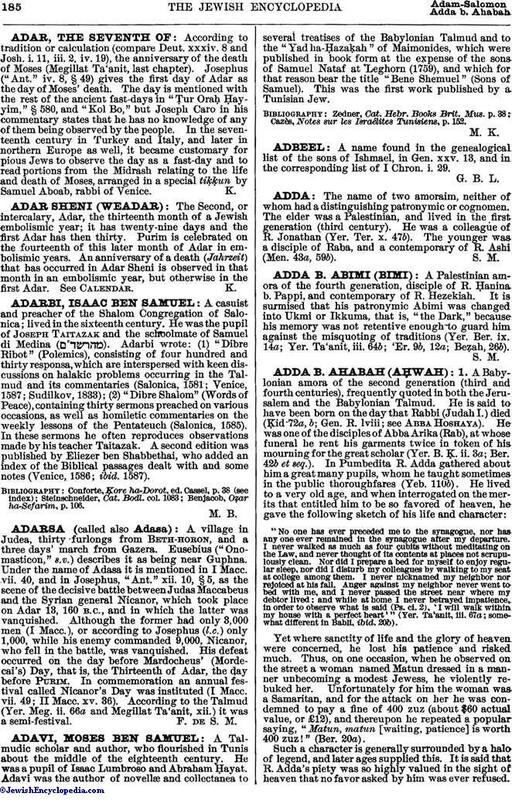 Under the name of Adasa it is mentioned in I Macc. vii. 40, and in Josephus, "Ant." xii. 10, § 5, as the scene of the decisive battle between Judas Maccabeus and the Syrian general Nicanor, which took place on Adar 13, 160 B. C., and in which the latter was vanquished. Although the former had only 3,000 men (I Macc. ), or according to Josephus (l.c.) only 1,000, while his enemy commanded 9,000, Nicanor, who fell in the battle, was vanquished. His defeat occurred on the day before Mardocheus' (Mordecai's) Day, that is, the Thirteenth of Adar, the day before Purim. In commemoration an annual festival called Nicanor's Day was instituted (I Macc. vii. 49; II Macc. xv. 36). According to the Talmud (Yer. Meg. ii. 66a and Megillat Ta'anit, xii.) it was a semi-festival.